The trunk of a giant oak tree, thought by experts to be more than 5,000 years old, has been unearthed in a field in Norfolk. 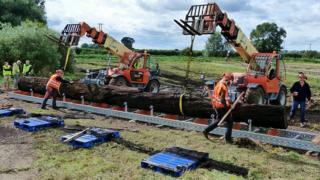 The 44ft (13.4m) Fenland Black Oak, or bog oak, was found buried in farmland at Methwold Hythe, near Downham Market. Planks cut from the trunk will be dried over seven months in a specialist kiln. A spokesman said the tree would make "a breathtaking table for public display giving an insight into the grandeur of these ancient giant forests". Bog oak is generally found buried in farmland. One of the rarest forms of timber in England, when dry it is said to be "comparable to some of the world's most expensive tropical hardwoods". Experts believe the Norfolk bog oak is "the largest-ever intact 5,000-year-old sub-fossilised trunk of an ancient giant oak", but think it could be just a section - possibly as small as a quarter - of the original tree. Standing trees began to perish as water levels gradually rose starting about 7,000 years ago and when they died they tumbled into silt that built up on the forest floor and this led to their preservation. Hamish Low, of specialists Adamson and Low, said: "This one is so special in that it is intact and, as far as I can tell, sound along its full 44ft length. "Along with the fact it is impossible to know how long Fenland Black Oaks will continue to rise out of the soil, and their inherent fragility, this one is worthy of preserving for the interest of the nation." Having taken a team of experts a day on Tuesday to unearth the tree and mill on site to 10 planks, the wood is being transported to London for drying. Working as the Diamond Jubilee Fenland Black Oak Project, Mr Low will lead a team of apprentice carpenters, in collaboration with the Worshipful Company of Carpenters, to create a 44ft table from the dried oak with the intention of putting it on show to the public. "Most people in the woodwork business will think it's a ridiculous thing to try and attempt, but they are digging up less and less bog oak and there is very little of it on public display," said Mr Low. "It's only by developing techniques over 20 years we've even dared to try and attempt this."